Troop Beverly Hills Turns 30! Tori Spelling, Shelley Long and Cast Reunite for the Film's Anniversary - Integration Through Media ....! Troop Beverly Hills is still a thrill! 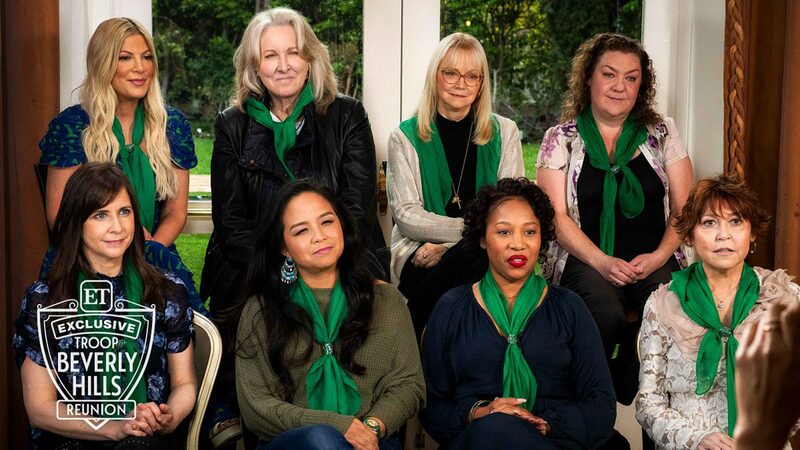 Stars Tori Spelling, Shelley Long, Betty Thomas, Kellie Martin and more reunited 30 years after the 1989 comedy premiered in theaters for an Entertainment Tonight special set to air Tuesday night. The popular film centers on a Beverly Hills socialite who is determined to prove her worth to her estranged husband (Craig T. Nelson) and to herself, by becoming a den mother to a troop of Beverly Hills Girl Scouts. Long then led the group in reciting the classic chant from the film, “We’re the girls from Beverly Hills, shopping is our greatest skill! We will fight and try real hard, leave behind our credit card!” they sang. “Beverly Hills, what a thrill! Beverly Hills, what a thrill!” they continued. The film was Spelling’s first movie role, which also starred Jenny Lewis, Carla Gugino, Mary Gross, Emily Schulman and more. Gugino, 47, played Chica Barnfell in the cult favorite and spoke about the impact it had on her. “Troop Beverly Hills was very key for me. It was the first job that allowed me to make enough money that I was going to be able to support myself and continue acting,” she told PEOPLE in August 2018. The Florida-born, California-raised actress admitted that she did one thing for that particular role that she’s never done again. See the full reunion on Entertainment Tonight on Tuesday.